Schmaltzy. Kitschy. Maudlin. Trite. Saccharin. These are all terms that might describe Jeanette MacDonald’s films, made in the mid-to-late 1930s. Today, she is mostly known as one half of America’s “Singing Sweethearts” with her singing partner Nelson Eddy. Their first film, “Naughty Marietta,” was a smash hit in 1935 and lit up the darkest days of the Depression. Many people today don’t even know who she is, as her name doesn’t trade in the same Hollywood recognition as stars like Joan Crawford, Greta Garbo, Jean Harlow. But MacDonald was a major box office draw, and in 1938 she was voted “Queen of the Movies”. In the 1930s, film was a unifying force to reach audiences from New York to California. For the first time, classical music might reach the eyes and ears of people living in rural America. Those for whom a ticket to the opera or a classical concert would be financially unthinkable. For many, the films of MacDonald would be their first introduction to classical singing and perhaps even classical music. MacDonald’s contributions shouldn’t be overlooked as peripheral, as she was integral in bringing classical music to the far reaches of the United States. MacDonald’s voice teacher was Grace Adele Newell, a woman who had studied directly under a gentleman by the name of Ferdinand Torriani. 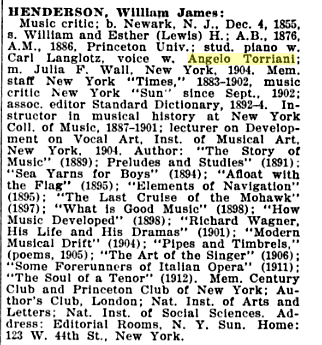 Torriani was the son of a famous Italian conductor and voice teacher, Angelo Torriani, who was rumored to have trained the voice of Adelina Patti. Torriani Sr conducted the very first performance of Aida in the United States! 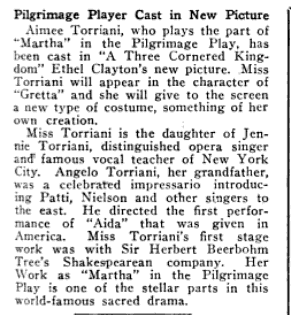 Torriani Sr.’s daughter was also a renowned singer and actress as well. W.J. Henderson, the author of several books on singing, was also a pupil of Torriani, Sr.. Henderson wrote several very important books on singing, including Early History of Singing (an historical overview of the training of the singing voice, which has been featured on this blog), Some Forerunners of Italian Opera, and The Art of the Singer. Edwin Baron Turk, in his book, “Hollywood Diva” points out the distinction of MacDonald’s musical contributions, and the shift in vocal aesthetic that happened quite dramatically in the 1940s. His theory is intruiging: that World War II began a rejection of European-inspired music, and ushered in the era of jazz and popular music, as a response to these Old World musics. The need to have “American Music” was important for the morale of the nation. In a conversation with the author, he remarked that what Maria Callas was to the lyric stage, Jeanette MacDonald was the operetta. There has never been another exemplar of her style, wit, and charm in that genre of music. Perhaps the only mainstream havens for the trained soprano voice today are Disney animated features and Andrew Lloyd Webber stage extravaganzas. In these venues, however, electronic sequencers, synthesizers, and mega-amplification have virtually stripped expansive singing-soprano and otherwise-of its prior links to ideals of delicacy and charm. The performances of Sarah Brightman in Phantom of the Opera, Glenn Close in Sunset Boulevard, and Madonna in Evita show that the female stars of most contemporary blockbuster musicals have little chance to project vocal freshness or idiosyncrasy. Be it on stage or screen, they often wind up sounding like disembodied dubbings. The opera critic Will Crutchfield notes with regret that current sound technology in virtually all branches of popular musical entertainment has bred the “perverse perception that the singing that … sounds most `natural’ is the kind requiring electronic enhancement to be heard.” For all the hullabaloo about how the sound engineers at Paramount and Metro boosted the volume of her voice, MacDonald never failed to generate vital presence in both the movie house and the concert hall. But classical operetta – the type of music MacDonald sang better than anyone and to which she owes most of her fame-has proven too singular and fragile to survive well when borrowed or tinkered with. Stage works by Stephen Sondheim, Andrew Lloyd Webber, and Claude-Michel Schonberg have overhauled the genre in assorted ways. Yet the mixed results of recent East Coast revivals of Lehar’s The Merry Widow, Romberg’s The Desert Song, and Herbert’s Naughty Marietta attest to the daunting standards of vocal technique, diction, interpretive subtlety, and emotional honesty performers must adhere to as a complete package if operetta is to avoid camp or hoity-toity affectation. MacDonald wielded that package in spades, but few of her successors have come even close. The best case for MacDonald’s contemporary worth must, I think, focus on her place in the history of cultural taste. MacDonald was the embodiment of cultured WASP-dom in mid-twentieth-century America. Whether she sang Charles Gounod, Rudolf Friml, Stephen Foster, or Nacio Herb Brown, she promised uplift and refinement to a nation of immigrants who craved legitimacy and social approval. For a large part of the population, she provided a first and defining encounter with the pleasures of classical music. The artistic avant-garde had already turned to Africa, China, Egypt, and Mexico for reinvigoration. MacDonald, however, championed American middlebrow. Despite the vaguely exotic issues of gender raised by her films, MacDonald’s appeal to the masses lay largely in her staunch allegiance-expressed through her music – to the Protestant ethic that facilitated America’s material growth: ambition, hard work, civic-mindedness, self-discipline. Her virtuosic singing was a sign of uncommon achievement. But MacDonald packaged it in a democratic manner, believing that all people could learn to understand, admire, and even emulate her success. She was confident that most people wanted to. World War II somewhat altered American attitudes toward “legit” singing. The United States had always been ambivalent about embracing cultured traditions over more humble ones. Though MacDonald was an outstanding favorite among millions of civilians and recruits throughout the war, her vocal style suddenly appeared to some as a pinch too reminiscent of Old World notions of aristocratic breeding and polish. The War Department, in ringing the praises of the common citizen, set the stage for the heightened popularity of screen singers who unambiguously projected down-to-earth American values, like Garland, Kelly, Betty Hutton, Alice Faye, and Betty Grable. By 1942 the hottest moneymaking team in movie musicals was no longer MacDonald and Eddy, but comics Bud Abbott and Lou Costello. The Tatter’s cavorting in MGM’s remake of the operetta Rio Rita relegated Kathryn Grayson, the picture’s “cultivated” warbler, to the background. Judy Garland enshrined the new populism by belting “The Joint Is Really Jumpin’ Down at Carnegie Hall” in MGM’s 1943 army-camp spectacular, Thousands Cheer. The Fight for Democracy, the entertainment industry seemed to proclaim, called for music that could energize the nation easily and swiftly. Pop, swing, and boogie-woogie became instant allies. Operetta- high-flown and less plainly native – aroused a dab of suspicion. Jeanette MacDonald was committed to ideals of true inclusivity and human connection. She tried to speak to the whole country, not just to those already hooked on opera and operetta. She carved out a common ground on which the masses and the privileged could share deep, emotional experience and dignified pleasures. As our democracy enters the new millennium, we are perhaps most in need of new cultural forms that can reconnect us with that sense of encompassing community. On January 16, 1965, the Chicago Daily News concluded its editorial on MacDonald’s death with resignation: “The older folks will mourn and remember Miss MacDonald and the young will never know what they missed.” It’s time to make up for our youthful ignorance by reclaiming MacDonald as an exemplary part of our American heritage. Turk, Edward Baron. Hollywood diva: a biography of Jeanette MacDonald. Univ of California Press, 1998.